I see something that inspires me to draw every time I take a walk. 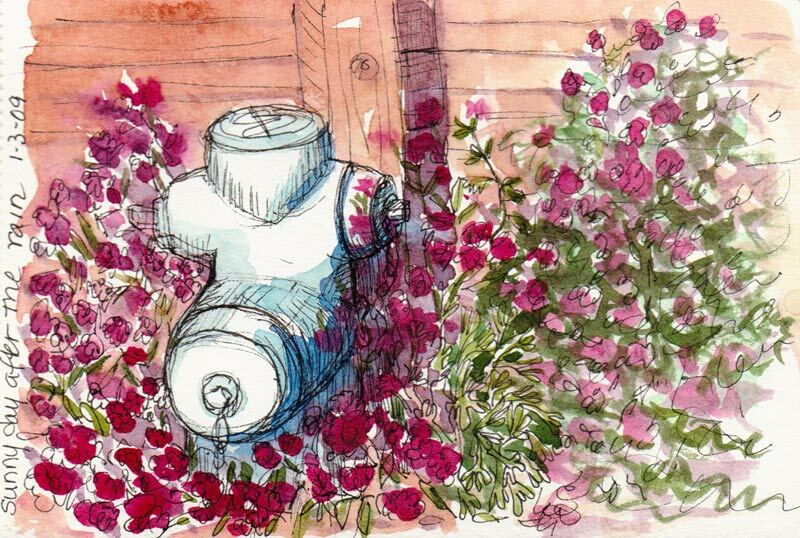 On this sunny winter walk, neighbors were out tending to their gardens, and flowers were blooming in unexpected places, like surrounding the fireplug above on a busy street corner. There’s a house a few blocks from mine where the front lawn was replaced long ago by a hundred different kinds of cacti and succulents. I wondered how they managed to keep the various spikey things trimmed and on this day I found out: carefully, with very thick gloves and shovels. They’d trimmed their enormous Nopales (or Prickly Pear) cactus and piled up the “paddles” in this old wheelbarrow. As the husband and wife worked they acted like it was completely normal for me to be standing in front of their house for 15 minutes sketching their wheelbarrow. I’m not sure what they ended up doing with the pieces of cactus. As I finished sketching, the husband piled a few paddles on his shovel and walked off down the street with them. Later I passed this cheery scene in someone’s driveway. I didn’t see anyone around, but the brightly colored chairs and containers of (?) on a tray looked awfully inviting. I used to be a fairly ok artist but am out of touch except drawing some simple pictures for my baby son. But looking at your pictures I feel quite happy, and I want to get back to drawing sometime soon (Id made some weak attempts in the past but did not follow through). Thanks and will keep visiting…! 🙂 Happy and COLORFUL new year to you! What a colorful neighborhood you live in!!! That’s my new year’s resolution, to see more color and beauty around me (which isn’t hard, since I live in Western Washington, a truly beautiful place…..but all that gray does get to me!). 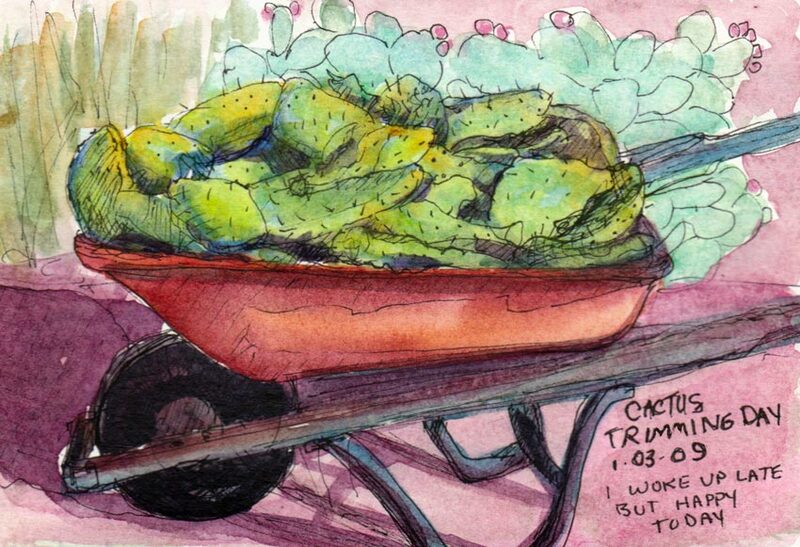 You are my inspiration!–Carol C.
What a great story – and I bet there isn’t another sketch of cactus trimmings in a wheelbarrow anywhere in the world! Oh, to walk down the street in a neighborhood where lawn chairs can be seen in January! Sigh! Thank you for sharing your warm experiences with we shivering easterners. Just curious:do you carry a watercolor box on your walks, or do you add color later? 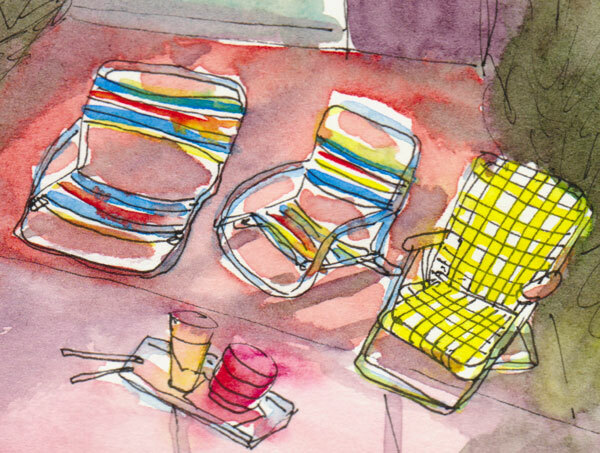 Your watercolors are simply captivating! The colors and magical and riveting 🙂 Love them. Great little stories to go with your sketches. Maybe the festive chairs were waiting for you to sit down and just enjoy yourself. Beautiful sketch of the cactus and wheelbarrow. Jana, you are going to get me sketching, yet. I woke up yesterday morning wanting to do a little watercolor of an oxalis plant! Weird, huh? Thanks for the walk around your neighborhood! The atmosphere is so very different from mine – especially now that there’s snow everywhere. No wonder my daughter can’t wait to get on a plane and go back out there!